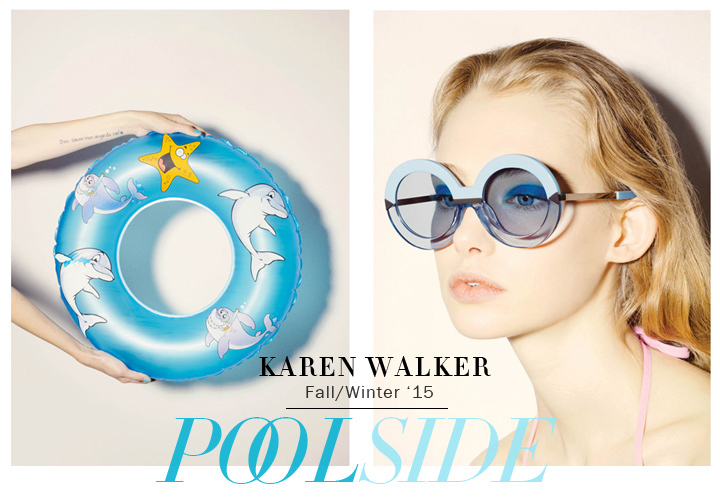 For some the summer might be coming to a close, but for New Zealand based Karen Walker summer is only just beginning! — As evidenced by the new “Poolside” Fall/Winter 2015 collection. Photographed by James Lowe, the collection is inspired by the glam Hollywood swimming pool paintings of English painter David Hockney. The range features color blocked acetates in a variety of shades, from watery transparent blues paired with sky blue lenses, to deep Sea blue topped with mirrored lenses, to black and tortoise combos.